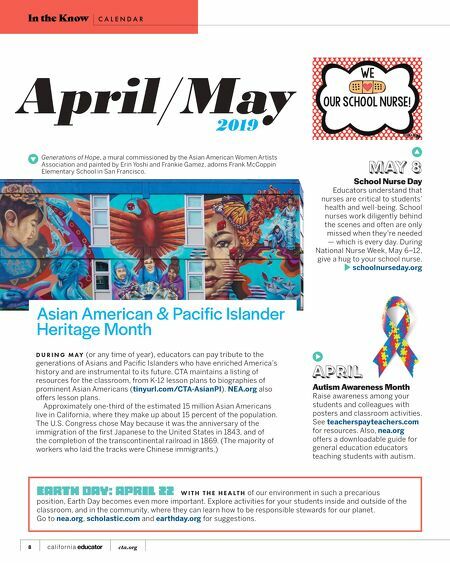 D U R I N G M A Y (or any time of year), educators can pay tribute to the generations of Asians and Pacific Islanders who have enriched America's history and are instrumental to its future. CTA maintains a listing of resources for the classroom, from K-12 lesson plans to biographies of prominent Asian Americans (tinyurl.com/CTA-AsianPI). NEA.org also offers lesson plans. Approximately one-third of the estimated 15 million Asian Americans live in California, where they make up about 15 percent of the population. The U.S. Congress chose May because it was the anniversary of the immigration of the first Japanese to the United States in 1843, and of the completion of the transcontinental railroad in 1869. (The majority of workers who laid the tracks were Chinese immigrants.) May 8 School Nurse Day Educators understand that nurses are critical to students' health and well-being. School nurses work diligently behind the scenes and often are only missed when they're needed — which is every day. During National Nurse Week, May 6–12, give a hug to your school nurse. schoolnurseday.org Asian American & Pacific Islander Heritage Month Earth Day: April 22 W I T H T H E H E A L T H of our environment in such a precarious position, Earth Day becomes even more important. Explore activities for your students inside and outside of the classroom, and in the community, where they can learn how to be responsible stewards for our planet. Go to nea.org, scholastic.com and earthday.org for suggestions. 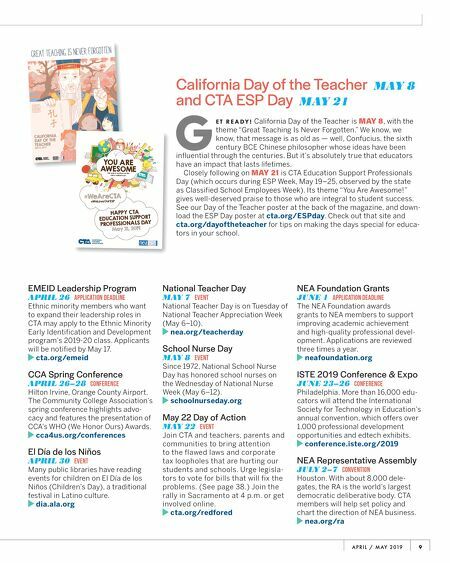 April / May 2019 8 cta.org In the Know C A L E N D A R Autism Awareness Month Raise awareness among your students and colleagues with posters and classroom activities. See teacherspayteachers.com for resources. Also, nea.org offers a downloadable guide for general education educators teaching students with autism. April Generations of Hope, a mural commissioned by the Asian American Women Artists Association and painted by Erin Yoshi and Frankie Gamez, adorns Frank McCoppin Elementary School in San Francisco. ILC: New study lauds "teachers teaching teachers"